The Darjeeling region of India is located in a spectacular mountain setting in the Indian Himalaya. This region was settled by the British as a hill-station and spa in the 1800’s because of its ‘healthy air.’ By the mid 1800’s the English began to cultivate tea in the hills and valleys throughout the Darjeeling region, and English tea drinkers developed a passion for the taste of this tea. Today Darjeeling tea is known as the ‘Champagne of Tea’ and it has loyal tea drinking followers worldwide. Among India’s diverse collection of fine teas it is known as ‘ the exotic one.’ It is beloved for its clarity of taste, invigorating aroma and smooth, crisp flavor. But Darjeeling teas vary quite a bit in style and flavor depending on the season in which they are plucked. Tea lovers should be familiar with a few elements of Darjeeling tea manufacture so that they can understand what they are purchasing and then determine what they like. smooth and rich in style with the characteristic Muscatel [raisin-y] flavor and aroma. 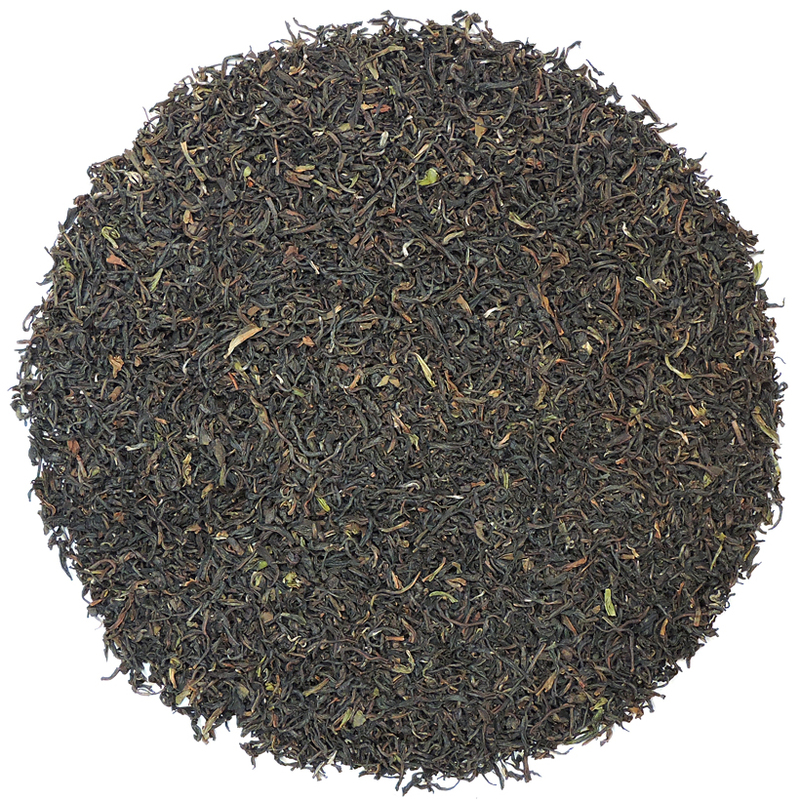 Autumnal Pluck Darjeeling (early autumn-plucked tea): for the late winter 2017 and throughout the 2018 tea-drinking season we have been pleased to be able to offer several ‘Autumnal‘ teas for the first time in many years. Plucked when cool weather returns, this minor crop offers an easy drinking, soft, mellow tea. These are all sold out for now and we hope 2019 offers a premium autumnal harvest for us. The continuing extreme drought conditions in the Himalaya have finally released their grip on agriculture in the region, so the Darjeeling 1st Flush early harvest was significantly improved in quality and volume this year. Many of the tea gardens with whom we work have tea this year that is extremely excellent, and the harvest began almost a month earlier than ‘normal’. Many tea harvests in the classic tea-growing areas are on a more ‘regular’ schedule in 2019 than they have been in years, both in quality and volume. So, although the 2019 harvest in the Himalaya (and some parts of China, too) started really early, the weather has calmed, the rains have increased, and the pace of growth stabilised. The leaf this year has been producing outstanding tea that is definitely better than it has been in many years! Tea Trekker will be sampling many more 2019 1st Flush Darjeeling teas this spring. Working with most of our ‘regular’ gardens, we will be able to source and taste many 1st Flush teas that are representative of the finest teas manufactured in both the heart of the Darjeeling region and also the Himalaya in general. Time is on our side with the expected long season and the subsequent 2nd Flush! Our offerings again this season will reflect our desire to source a broad selection of gardens without necessarily committing to a year’s worth of inventory of every estate’s tea. This was our method the last several years and it has been working quite well. We are finding that our clientele is not as interested in locking into a flavor or garden style that they will drink for a year (or a lifetime!) as much as they are interested in choice and having a variety of gardens represented that can be tasted at different times throughout the year. In general the teas from the Himalaya are showing a very high quality (and incredible depth of flavor) this season. This search during our sourcing and tasting is what keeps our curiosity piqued, and our senses sharp. Bob in particular here at Tea Trekker is very happy with the teas that he has tasted and sourced from the 2019 tea harvest. It is wonderful to extend the 1st Flush season over a longer period of time because the tea benefits from being harvested a little bit later in the year in many of the gardens, and the short ‘resting’ period that is so common in China tea can improve the style of many Darjeeling teas (remember that many Darjeeling plantings are China Bush). As with all agricultural crops, not all plants, even in the same general location, mature at the same time! We tasted samples of many 2nd Flush 2018 Darjeeling teas during August of 2018 and have been quite pleased with the 2nd Flush teas from the 2018 harvest. They are all drinking well and are a treat to have until the 2019 season’s 2nd Flush teas arrive in July & August of this year. A further, related note is that the tea-growing regions of both Nepal and Assam are having spectacular tea-producing seasons again this year, so keep an eye on those Indian teas too. We have recent arrivals from Nepal in particular that are stunning.